Helambu trekking is another popular trekking trail, lying in the Langtang region. 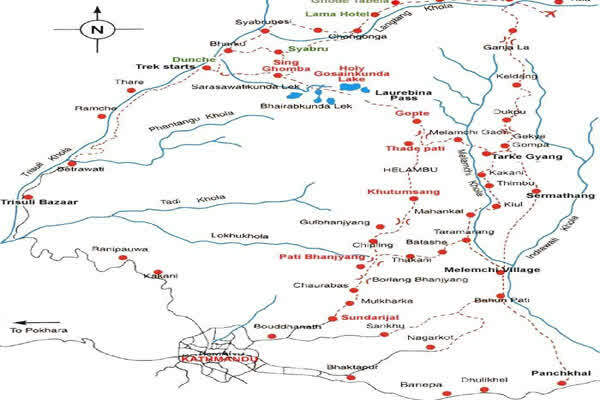 The trekking in Helambu area offers an opportunity to explore ancient villages, a wide range of animals such as red pandas, pika, musk deer, Himalayan black bear, Himalayan Tahr, Ghoral, Serow, rhesus monkey and common langur. Likewise, tourists also can enjoy with the scenic views of the mountains--Langtang Lirung, Dorje Lakpa, Gaurishanker, Ganesh Himal, Langshisa Ri, Gangchenpo, Yala peak, Naya kanga, Annapurna Himalaya range and enjoy with the cultural blend of Tibetan Sherpa. 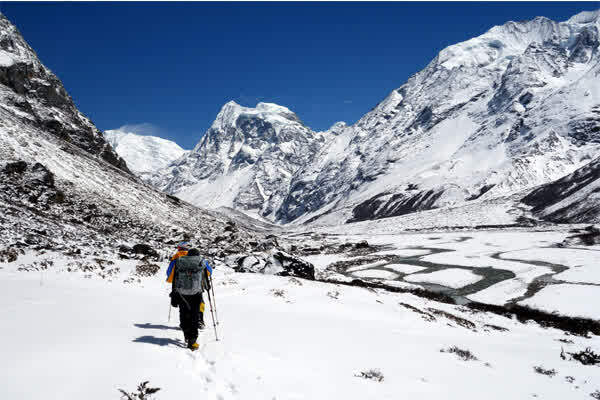 The Helambu trekking in Langtang region includes the trip to the remote and spectacular valley of the region and the high mountain lake known as holy ‘Gosainkund’. This trekking is relatively low altitude trek and is considered to be one of the best areas for having a short trek, as it is close to Kathmandu. During the trek in Helambu, is all about hiking between mostly at the lowest altitude 3000m and the high point is Tharepati La pass (3600m). You will have two option where to begin your trekking route. The trekking to Helambu area either begins from Sundarijal, some two-hour drive from downtown in Kathmandu valley or begins Syabru Bensi, which is seven/eight hour drive from Kathmandu, then we trek through larch and rhododendron forests which is rich in wildflowers and birds, explore the head of the valley getting close to the glacier system. Finally we climb on the nearby peak for amazing mountain views. Subsequently, from the place, we ascend up and pass the holy lake Gosaikunda and enter Helambu. After visiting the area and enjoying the cultural blend of diverse ethnic people residing in the area, we return to the place called Chisapani and then return back to Kathmandu. At your arrival at a Tribhawn international airport, Kathmandu our office representative from Alfresco Adventure Travel wait for you outside at Arrival gate with your Name card. Our team will welcome and collect your all baggage at the airport. By formal introduction with the representative, you will be transferred to your hotel. In the evening you will enjoy complimentary welcome dinner in a typical Nepali restaurant with Nepalese cuisine. Overnight at hotel. Sightseeing Kathmandu and pre-trek preparation. From Chisopani the trail leads down to Pati Bhanjyang (1770m), a lovely small village. After reaching Pati Bhanjyang, the trail leads up and then down to the village of Gul Bhanjyang (2140m). From here the trails climbs up to 2620m and then again descends along the rocky route to Khutumsang (2470m). We climb above Kutumsang on a steep trail mostly through fir and rhododendron forest where there are no permanent settlements. The trek continues 6-7 hours to Yurin Danda with magnificent views of the Himalayas. Finally, we arrive at Tharepati for our overnight stay in full board teahouse. Turning east, the trail rapidly descends down a ravine through small Sherpa village of Malemchigaon (2530m) with splendid lodges and fine old and artistic Gompas. The trail again descends leaving the village and crossing Malenchi Khola by a bridge at 1890m and making the long climb up the other side of the valley to Tarke Gyang at 2620m, which is the largest village in Helambu. Since, we do not gain altitude that much today; it's going to be comparatively easy walk. We cross forest, streams, and waterfalls along the way within 4-5 hours. The trail makes a sweep around the wide valley end between Parachin and the Sherpa village of Gangyul. From Gangyul, we arrive at Sermathang. Discover the village. There is also a Buddhist monastery at the highest point of the village. Here we set our overnight stay in teahouse. Today we immerse ourselves in the local culture, taking time out to meet the people of the area and understand their lifestyle and customs. It also acts as a spare day in case you wish to take the trek a little slower. On our final day of the trek, we walk down to Malemchi Pul Bazar. The village is mostly inhabited by the Sherpa, but there are also people of other ethnicities. From the Bazaar, catch the bus to Kathmandu. overnight at hotel Kathmandu. Today is set for your rest day to explore your free time shopping in Kathmandu or a scenic mountain flight of Mt. Everest exploration as an extra activity if required. At the evening alfresco Adventure offers you the Typical Nepalese Cultural Dinner in a renowned local food restaurant.